Meet Joe. He's from, you guessed it, the East Coast. He grew up in the Bronx where he spent his weekends walking hand-in-hand with grandpa to the local market. Joe knew he wanted to be a chef since he was a little kid. And so when he was a big kid, he moved to the US Virgin Islands, where he owned and operated two restaurants. 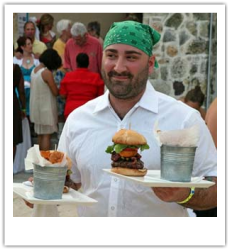 Two awards later and an induction into Best Chefs America, Joe was ready to leave Caribbean life and start a new project. He had always spent his off-season months in New York, Maine and Massachusetts, but this time he headed out west to Denver, Seattle, Denver, Osaka, and then again Denver. It had the bright sunshine of island life, but was free of humidity. Road trips were no longer an imaginary thing, and the people were just flat out cool. The only thing missing was water and the food that comes with it, which is why Joe decided to open up a lobster roll food truck. 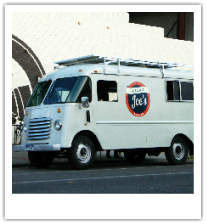 He set out on a search for the perfect truck- something with character- and it never failed us. With our sights set on traveling across the country though, we knew we needed to upgrade to something bigger, built for large events. In 2018, we purchased a brand new Ford F59 and had the truck of our dreams built by Prime Design Food Trucks.